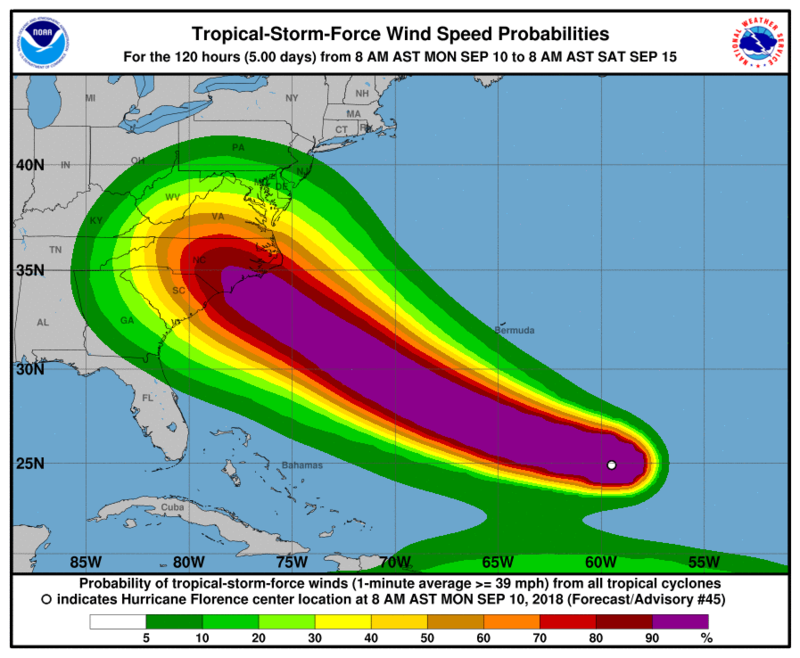 9/10/18 – The National Hurricane Center has issued a special statement regarding Hurricane Florence, now a Category 4 hurricane in the Atlantic taking aim at the U.S. East Coast and expected to make landfall on Thursday or Friday this week. Read the 11 am advisory. • Large swells affecting Bermuda and the U.S. East Coast will continue this week, resulting in life-threatening surf and rip currents. We advise all Flood Panel LLC customers on the U.S. East Coast, especially along the Carolina and Virginia coastlines, to prepare for a major hurricane. 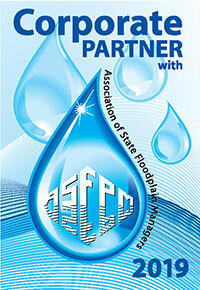 Install your Flood Panel solutions and put your Flood Emergency Operational Plans into action now. For the latest information on Hurricane Florence, check with The National Hurricane Center. Read the Flood Panel blog post for more information about planning for flood emergencies. A new proposal by the Federal Emergency Management Agency would enable people whose homes were destroyed by floods and then bought out by the government to retain the flood-prone lands to rebuild or sell. 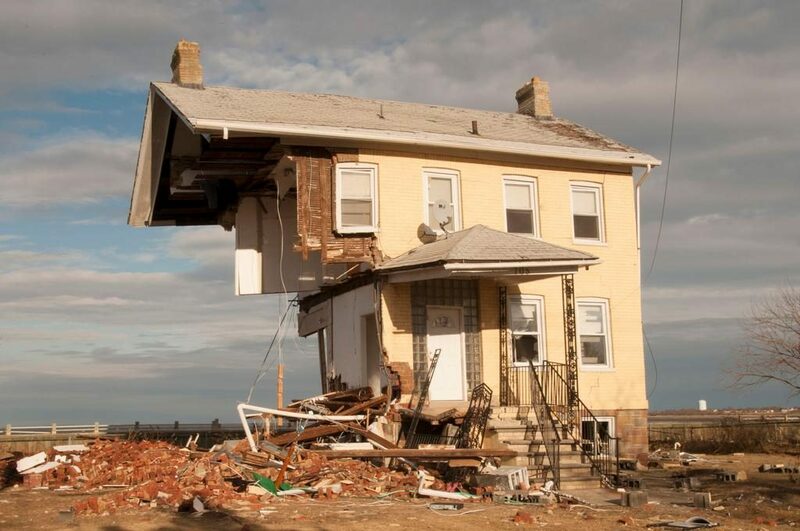 If adopted, it would contradict FEMA’s long-standing policy of buying out and removing homes repeatedly damaged by floods, and then converting that land into open space. The proposal has drawn sharp criticism from the New Jersey Flood Plain Managers and the National Resource Defense Council who believe it will perpetuate building on land at greatest risk to flooding and at highest cost to taxpayers. FEMA’s current policy to repurpose land into open space is short-sighted and makes little practical sense. Why would a person who paid millions for a home by the shore allow the government to take the land instead of pre-emptively working with an engineer to create a hurricane-proof structure raised above the flood plain? This has been the norm here in Florida for some time. 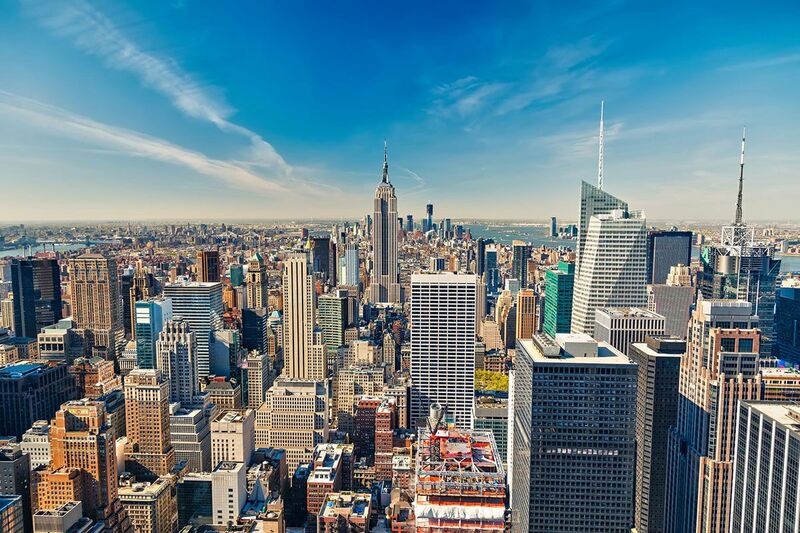 New York and New Jersey could learn a lot from the work that Florida has done to change code requirements and help homeowners and businesses deal with the constant issues of hurricanes and flooding. The approach in Florida is all about storm hardening, not giving up. I suspect the new FEMA proposal stems from lawsuits and politicians worried about the impact of undeveloped land on the tax base. Either way, if FEMA is going to burden taxpayers with the cost of rebuilding, the international building code must be enforced and special engineering standards must be met for all structures built in a flood zone. It makes sense. FEMA’s proposal is not without problems. It would grant rebuilding money to homeowners who were approved for flood insurance without following dry flood proofing protocols. The maximum insurance payout was $250,000. Under the new policy, the homeowner would be able to collect the full value of the home, potentially millions of dollars. Taxpayers should not be responsible for a gambler’s debit, penalized by short-sighted homeowners who decide to roll the dice rather than pay higher insurance premiums to protect their homes. 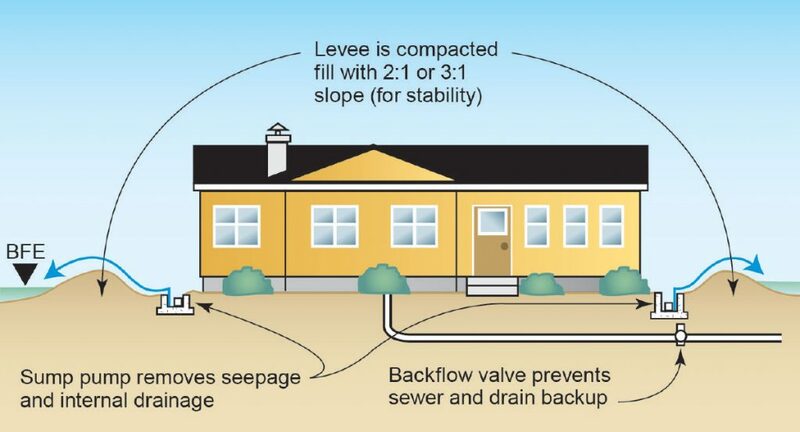 It is troubling that homeowners are not required to follow the same dry flood proofing guidelines as commercial building and business owners. FEMA must take steps to ensure that rebuilding funds are distributed only if dry flood proofing protocols are met. Without that assurance, taxpayers will be caught in a vicious cycle of paying every time these properties are wiped out by floods. Tom Osborne is the owner and president of Flood Panel, LLC based in Jupiter, Florida. He oversees design, development and manufacturing of flood mitigation products for commercial buildings in flood zones nationwide. Osborne works closely with the Association of Flood Plain Managers and is a member of the Small Business Association of America. He is also a Certified Provider of Continuing Education for the American Institute of Architects for Dry Flood Proofing Commercial Buildings. We are all too familiar with annual springtime floods that arise from a deadly combination of snowmelt and seasonal showers. But there is an unexpected threat that can sometimes produce floods when we may least expect it: in the dead of winter. Several communities in recent months have been either actually flooded or under severe flood threat when rivers and large streams began to pack up chunks of ice against rocks, bridges, or narrow culverts. The resulting jam of mini-icebergs built up against itself, then froze solid into a veritable dam that backed up still-moving water with deadly speed. During the early months of this year, there have been many flooding events caused by ice dams that sent frigid rivers streaming onto roads, residential communities, and businesses. More than a few of these events occurred in the State of Maine, which is blessed with many wild rivers and, some would say, cursed with very cold weather. At any rate, a quick search of 2018 flooding records will turn up many floods in this state caused by ice dams. 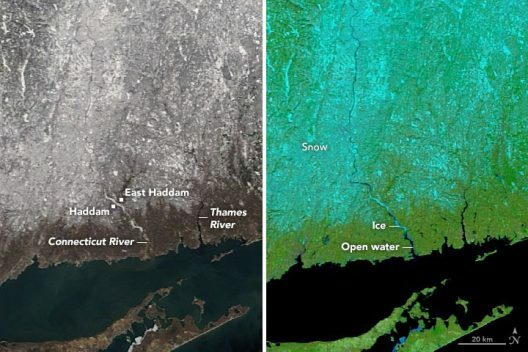 Heavy rains and swiftly warming temperatures followed a prolonged cold spell in the Northeastern U.S., leading to a long ice jam that clogged the Connecticut River. The Moderate Resolution Imaging Spectroradiometer (MODIS) on NASA’s Terra satellite collected natural-color (left) and false-color (right) images of the ice on January 18, 2018. In the false-color image, ice appears light blue, and open water appears black. A second large jam is visible south of Haddam, Connecticut. One such flood took place in Fryeburg, Maine, when the Saco River was blocked by a huge ice dam that sent a deep sheet of water flooding across the aptly named River Street. Due to the frigid temperatures that caused the ice dam to form, the flooded water quickly turned to a thick sheet of ice that covered the road; this was very difficult to remove without breaking up the underlying road itself. Luckily, this flood did not threaten any residential communities, but it did force the closure of River Street and caused inconvenient traffic detours. Other communities were not so lucky. The town of Kent, Connecticut suffered dreadful anxiety, inconvenience, and damage from a mile-long ice dam on the nearby Housatonic River. This ice dam backed up for miles onto major roadways and residential areas. Naturally, as soon as the floodwater intruded into roads, it froze solid into a massive block of ice that stretched for miles along crucial transportation routes. In some areas, cars and other vehicles were completely encased in a block of ice that reached halfway up to the roof. Desperate citizens called for the ice dam to be broken up with dynamite or wrecking balls, so plagued were they by the resulting “ice flood” that impacted a vast area. Residences that are flooded during this season are similarly afflicted by the fact that ice is exponentially more difficult to deal with than is regular flood water. Hot water heaters and furnaces are typically located in cellars, and when a basement is entombed by a foot of ice it cannot even be pumped out! The home quickly becomes uninhabitable when heating systems are gripped by solid ice. Essential services in areas that may be exposed to floods — no matter what the cause — must be protected by mechanical flood panels, geographical flood defenses, or other flood barriers if emergency response is to remain available during these disasters. Ice dams, and the unexpected and very sudden flooding that these dams can cause, are just one more reason to ensure that ALL hospitals, clinics, and fire stations remain protected by the new flood panel technologies that are available today. In this case, a penny well spent on prevention is truly worth a pound of cure.